Many teachers like to use the learning game/formative assessment “Four Corners” in which students move to a corner in the room to designate their answer. This activity is particularly good for multiple choice. However, I have noticed that my kids move like a flock of sheep….following the person they think is right. So I decided to try Four Corners with a twist… I hung my A, B, C, D signs up in the corners of my room. Students were then asked to go to the corner of their choice. “But what’s the question????? they all shouted. I then revealed the first multiple choice question (only) on the SMART Board. I used the screen shade to hide the four choices. I asked them to find the verb (still without choices). I then revealed the four options. Those students standing in the correct corner earned a point. Now you might think that this does not require them to do much thinking. However, everyone has time to process and determine an answer and then, upon the reveal, you hear a chattering of “Yessssssss!! !” and “Aw man!! !” as they learn their fate. This game keeps kids moving and keeps them engaged. It also eliminates embarrassment for the kid who is always wrong. The game appears to be left up to chance. It becomes a risk for everyone. Anyone who knows me knows I am not a big risk-taker. That doesn’t keep me from loving this quote. 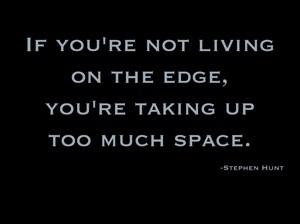 As I get older, I do find myself creeping out towards the edge. I like this idea a lot. It gets kids moving, and they always like some sort of game or competition. I find that I need to have an “up and moving” activity every 15-20 minutes with this group. Being 1st period, this sometimes includes 20 jumping jacks or marching in place. That always seems to perk them up. I’m not quite sure I understand the point of having students identify the verb in the question before revealing the answer choices. Can you elaborate? I let them think about it for a few seconds while they were already standing at their chosen corner. Everyone standing at D cheered because they knew they were right. Those at the other letters groaned when they were at the wrong letter. The key is to give everyone enough wait time before you give them the choices. I hope that makes a little more sense????? Let me know!